Casio’s G-Shock line of shock-resistant watches have been adorning the wrists of outdoorsy types since the release of the first G-Shock branded watch in 1983. 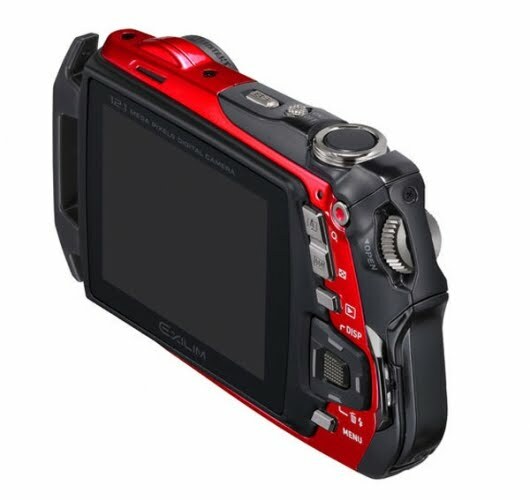 The company extended the rugged specifications of the G-Shock line to mobile phones with the release of the G’zOne durable, water-resistant mobile phone in 2000, and has now further extended the brand to compact digital cameras with the release of the EX-G1 shock-resistant, waterproof, dustproof digital camera – the first in the company’s new EXILIM G line. Casio is marketing the new camera to adventurers and those people athletic enough to find themselves wanting to fire off a few shots in severe environmental conditions. 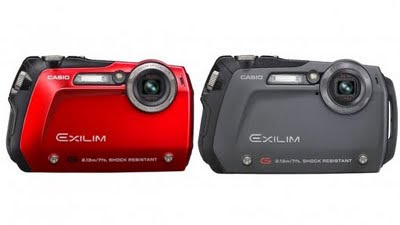 Presumably, for the rest of us who can’t claim to fit in either category but classify ourselves as clumsy photographers, we will still benefit from the camera’s rugged specs that include a two-layer construction with stainless steel outer casing and a polycarbonate cover that absorbs shocks to the body side near the shutter. The camera's waterproof inner body consists of polycarbonate reinforced with fiberglass while a buckle-lock construction is added to absorb impact, and a resin lens ring protects the lens. The shock-resistant shell of the EX-G1 has passed drop tests including multiple falls from 7ft (2.13m) and offers a profile of just 0.78 inches (19.9mm) excluding protruding parts, which Casio claims is the world’s thinnest profile for a shock-resistant camera. It is impervious to dust, with performance corresponding to IP6x protection class dustproofing and can be used at depths of up to 10ft (3m) for 60 continuous minutes thanks to IPX8 class waterproofing. It is also freezeproof, capable of withstanding temperatures as low as 14°F (-10°C). The acrylic plate protecting the 2.5-inch 960 x 240 resolution LCD display from water pressure and shocks is 1.5 times thicker than conventional point-and-shoot cameras, while a resin mount is designed to ease shocks to the LCD panel area. The 12.1MP camera also features a 3X non-extending zoom lens ranging from 38-114mm (35mm film camera equivalent) and captures 16:9 wide format video at 848 x 480 pixel resolution. An interval shooting function can automatically take still photos or movies at fixed intervals, while the high speed continuous shutter is able to take up to eight shots at three frames per second at 1600 x 1200 pixel resolution, which are stored on microSDHC or microSD memory cards. The Casio EX-G1 G-measures 103.5 (W) x 64.2 (H) x 19.9 (D) mm (4.07 x 2.52 x 0.78 inches) and weighs around 154g (5.4oz). It will be available in black (EX-G1BK) or red (EX-G1RD) for an MSRP of approx.US$299.99.